In most Western European countries, retiring and entering grandparenthood are relatively parallel events for most individuals, with grandparenthood often occurring a few years before retirement (Leopold and Lechner, 2015). Does being or becoming a grandparent influence the retirement decision? If yes, in what sense and by how much? The topic may have consequences for the labor market, individual pensions, and pension systems, but also in terms of family life, intergenerational family relations, and family policy. Grandparents’ retirement preferences may also have positive outcomes for the grandparents themselves. Grandparenthood has been shown to be very important for older men and women alike, and is positively associated with well-being and life satisfaction (Drew & Silverstein, 2007). Working grandparents: weaker labor market attachment? One of the factors that condition and are conditioned by the grandparent–grandchild relationship is grandparents’ role in the labor force. For instance, working grandparents tend to engage in relations with their grandchildren less frequently and are less likely to provide childcare (Hank and Buber, 2009). 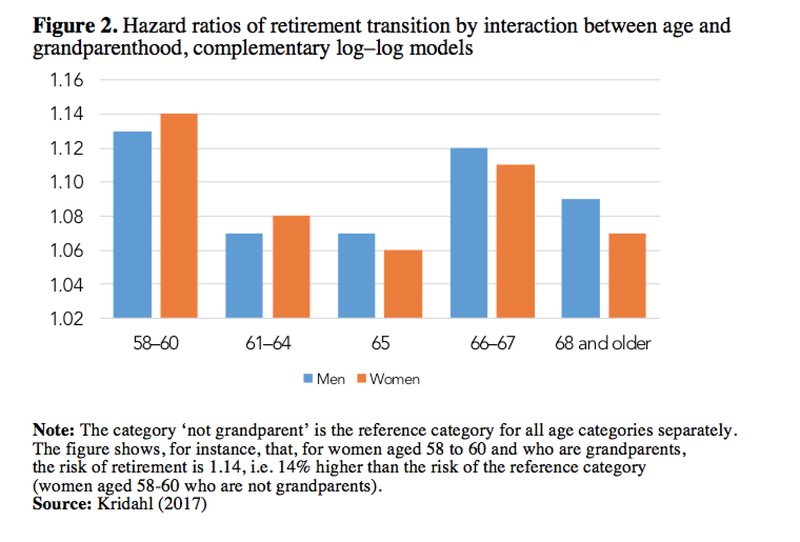 This may explain why grandparents display a weaker labor market attachment and a preference for early and full retirement, i.e., a lower propensity to participate in bridge employment. This happens also in countries with high childcare coverage, such as Sweden and Norway, for example (Van Bavel and De Winter, 2013). While in certain countries, like Spain and Austria, grandparents are the preferred source of childcare when parents work (Jappens and Van Bavel, 2012), in Sweden it is parents who are the primary caregivers during the early years of a child’s life, as the gender-neutral parental leave period stretches for more than one year. Moreover, Swedish policies guarantee subsidized public childcare starting at age 1 and low-cost after-school centers for children aged 6‒12 on weekdays between 7 a.m. and 6 p.m. Nonetheless, comparative studies have found that the probability of grandparents providing grandchild care is high in Sweden and that the Nordic welfare regime generates less intense but more frequent social support (including grandchild care) from parents to adult children (Hank and Buber, 2009). Compared with other countries where parents depend more regularly on grandparents’ support and caregiving, the relatively generous childcare provision in Sweden is likely to allow grandparents to engage with grandchildren on the basis of their own preferences or as a complement to institutional care. 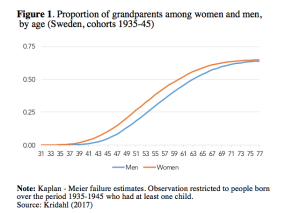 In a recent study, Kridahl (2017) shows that most parents become grandparents before, or close to, the period when retirement typically occurs and that women tend to become grandparents at younger ages than men in Sweden (Figure 1). The study is based on Swedish register data, and is restricted to the individuals (around 800,000 in total) who were born between 1935 and 1945 and had at least one surviving (adult) child. Individuals are “observed” between 1993 and 2012, from the year they turn 58 until they retire, die or migrate. As the multigenerational part of the data includes all registered children living in Sweden, it is possible to have exact estimates of the year of birth of each grandchild and make all grandchild measures time-varying. Some individuals are already grandparents when they enter the window of observation, and some become grandparents after age 57. The timing of entry into grandparenthood among these cohorts is shown in Figure 1. The study also shows that grandparents at different life stages have a higher propensity to retire than non-grandparents. However, there is also variation among grandparents: for instance, the more complex the kin constellation, the higher the propensity to retire. 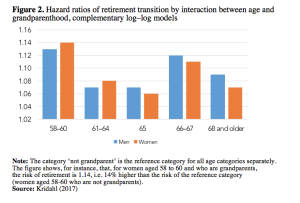 Grandmothers’ retirement behavior does not significantly differ from that of grandfathers, contrary to what one might expect on the basis of the traditional division of gender roles. Moreover, as entering grandparenthood and retirement timing are typically closely spaced, as they are both highly dependent on age, Kridahl (2017) additionally investigates whether the influence of grandparenthood on retirement timing differs by age of the grandparents. Indeed, grandparenthood influences retirement more strongly among those who are relatively young (below 61 years) and relatively old (above 65). In between, its effect is lesser, but not negligible (Figure 2). Multigenerational family diversity also influences retirement timing among grandparents. Overall, the greater the number of grandchildren and the richer the “set” (i.e., adult children who have their own children), the greater the propensity to retire. Moreover, the older the youngest grandchild, the earlier the grandparents retire. In my dataset, while the difference between the ages of the youngest grandchild was small, grandparents whose youngest grandchild was under six were less likely to retire earlier than those whose youngest grandchild was in already school aged. In Sweden, care needs do not seem to be the prime reason why grandparents decide to retire early. Rather, it is their own (i.e., the grandparents’) desire to engage with grandchildren that matters, and their perception of time constraints. Retiring early may cause financial losses, but the benefits of grandparenthood are stronger. 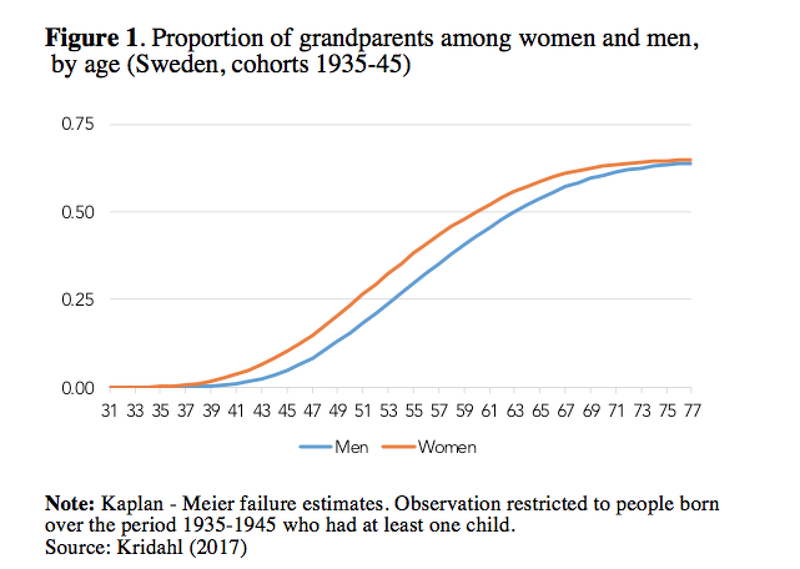 This is probably one of the reasons why grandmothers and grandfathers have similar retirement behavior in Sweden – the other being that both parents engage similarly in their children’s lives from the very beginning of family life, in line with Bengtson’s (1985) expectation that gender differences are tending to disappear, at least in Sweden. The age of the grandchildren has its importance, too: the grandparental role can become more complex as the grandchildren grow older. This is also the case when there are several grandchildren, a factor which increases the propensity to retire. However, this also depends on the number of adult children (i.e., the “middle” generation), and on the complexity of the kin constellation (e.g., due to union dissolution and new family formation). Another explanation may be an expanded meaning of grandparenthood based on the number of grandchildren, with many grandchildren forming a multiple attraction. Surprisingly, grandparents in Sweden have a lower propensity to retire when their grandchildren are very young: this reinforces our conjecture that, when they retire, they do not do so because they are needed for child care, but because they prefer to spend some time with relatively grown-up children, with whom they can probably engage in a more rewarding relationship. Bengtson, V.L. (1985). Diversity and symbolism in grandparental roles. In Bengtson, V. L. & Robertson, J. F. (Eds. ), Grandparenthood. Beverly Hills, CA: Sage. Drew, L.M., Silverstein, M. (2007). Grandparents’ psychological well-being after loss of contact with their grandchildren. Journal of Family Psychology, 21(3), 372–379. Hank, K., Buber, I. (2009). Grandparents caring for their grandchildren: Findings from the 2004 Survey of Health, Ageing, and Retirement in Europe. Journal of Family Issues, 30(1), 53–73. Jappens, M., Van Bavel, J. (2012). Regional family norms and child care by grandparents in Europe. Demographic Research; Rostock, 27, 85–120. Kridahl, L. (2017). Retirement timing and grandparenthood in Sweden: Evidence from population-based register data. Demographic Research, 37(31), 957–994. Leopold, T., Lechner, C.M. (2015). Parents’ death and adult well-being: Gender, age, and adaptation to filial bereavement. Journal of Marriage and Family, 77(3), 747–760. Van Bavel, J., De Winter, T. (2013). Becoming a grandparent and early retirement in Europe. European Sociological Review, 29(6), 1295–1308.